The best induction wok is going to depend on individual preference. At The Equipped Cook we review the 5 best induction woks in five different categories. In a hurry? Need an induction wok fast? For the price, this modern stainless steel wok is induction compatible and gives you the convenience of being dishwasher-safe. The traditional cast iron wok has evolved. There are now hundreds of woks available. Some are cast iron but there are also others that fall into the categories of non-stick surfaced, stainless steel, light weight, enameled, pre-seasoned, or ceramic coated. Of course, there is the usual one-handled wok. But there are also models with an extra support handle or heavy woks with two small handles which are not used for tossing the food. If you’re looking for the best induction wok for your own cooking style, read on. With so many choices there is also a huge range in prices. Your basic wok starts from about $30 and goes up to about $600 or more for commercial grade quality. What is an induction wok? If you want to use a wok on an induction cooktop, induction range or a portable induction burner you’ll need an induction compatible wok. For the price of a carbon steel wok you get great conductivity on an induction cooktop. It needs to be made from ferrous material so it can conduct the electromagnetic force through the wok and generate heat. The bottom of the induction wok needs to be sufficiently making contact with the cooktop to work. A traditional curved bottom wok will not work efficiently. Some cooks have managed to get one of these woks to work on induction because enough of the curved base is close enough to the induction surface. However, it is hit and miss and no one would recommend trying it if you want to successfully stir fry at a high temperature. What makes a wok good for induction cooking? The best induction wok is a flat bottomed one. The flat surface makes direct contact with the cooktop and you can generate high cooking temperatures very quickly using induction. As mentioned, the wok needs to be magnetic as well. Home cooks can get superb results from one of these. If you are a professional chef there are induction cookers made especially for woks. The surface on the cooker is curved and the wok sits down into the curved surface on the induction burner. These types of appliances are very expensive costing as much as $7,000 for a single induction wok burner. They are usually intended for restaurants or commercial cooking. We do not discuss this type of appliance in this article. But if you’re interested in purchasing one, take a look at some of them Here. Induction compatible woks cook very well. They can generate high levels of heat to stir fry and they are stable when sitting on your cooktop. For the price of a traditional cast iron wok with a flat bottom you can achieve high heat and traditional wok cooking with induction. If you are concerned about a wok scratching the surface of your induction cooktop this is easily resolved. The best way to do this is by placing a thin silicone baking sheet over the top of your cooktop burner and place the wok on top. Some cooks use a sheet of kitchen paper but the silicone mat is more protective and easy to wipe clean. Just make sure the silicone baking sheet is thin enough to be used on your induction cooktop. The trusty old cast iron flat bottomed wok is perfect for induction cooking because it is made of ferrous material. But these days you are not limited in choice. There are lots of non-stick coated woks and you also have the choice of lighter or heavier weight woks which are suitable for induction. Enameled cast iron is also a very popular choice. Can I get an induction wok with a lid? There are plenty of induction compatible woks sold with lids. Some also come with an internal rack which sits on the side for cooking meat, fish or others food separately to the stir-fried vegetables. Most woks range in size from 12-inches to 16-inches. Most people agree a 12-inch or 14-inch wok is big enough to feed a family of 4 to 6 people. The larger size can be too big to store, especially if it also has a lid. Larger lids often don’t fit in the dishwasher and become a nuisance. Out of hundreds of woks available the following are chosen as being the best in their category. Each review is of an induction compatible wok. Non-induction models have not been included. Cast iron is the traditional metal used to make woks. This is a perfect material for induction cooking. As long as you buy a flat bottom cast iron wok, it will work on your induction cooktop. The Lodge Pro-Logic P14W3 Wok is a cast iron wok made in the USA. While the underneath surface is flat, the inside surface of the wok is round like a traditional wok. It is 14-inches in diameter and large enough to feed a hungry family. Both cast iron and carbon steel woks need to be seasoned before use. The seasoning provides a natural non-stick surface. This is achieved by coating the surface with oil and in combination with heat the oil is baked into the cast iron. Seasoning prevents the cast iron wok from rusting as well as producing the natural non-stick surface. Soaps and detergents should not be used to wash this type of wok. It is recommended that it be cleaned with hot water and a non-abrasive sponge. This Lodge wok comes pre-seasoned and ready to use. Cast iron takes a while to heat up but once it is hot it retains a high temperature very well. This induction wok has two cast iron handles. Can this wok be lifted up? The advantage of these handles is that the wok can be placed in the oven if you need to. The disadvantage is that the handles become so hot that you won’t be able to lift it while it is still at a high temperature. This wok is very heavy so you probably wouldn’t want to be moving it anyway. It certainly won’t move around your cooktop because of its weight. You will need to spoon the food out (or use two spatulas) and let the wok cool before lifting. Because it is a heavy cast iron wok you’ll need a good wok spatula. If you want to lift and toss the food in a stir fry you’ll need two wok spatulas. If you are ordering this wok online make sure you order a couple wok spatulas at the same time. Order a thin silicone baking sheet as well to protect your induction cooktop. The biggest advantage in buying a cast iron wok is the price. These are the cheapest woks available for use with induction. They last a lifetime and are good quality. Lodge makes good quality cookware and this includes their woks. Carbon steel woks are similar to cast iron but they’re not as heavy. A flat bottom carbon steel wok will work on an induction cooktop and will conduct heat well. This M.V.Trading carbon steel wok will serve you well. It is 14-inches in size and is made in the USA. Similar to a cast iron wok this carbon steel one needs to be seasoned. For the price of this cookbook, you get tasty traditional recipes to turn your stir fries into amazing meals. It does not come pre-seasoned so you need to follow the directions included with the wok to season it before use. There are also plenty of YouTube videos showing you how to season a carbon steel wok. A carbon steel wok will last a lifetime if looked after properly. Carbon steel woks have the same advantage as cast iron in that they are cheap to buy yet they are high quality cookware. It is nice to be able to spend less on a pan which is still ideal for induction cooking. This carbon steel wok for induction cooking has two handles. The nice thing about two small handles rather than one longer one is that they don’t get in the way. Because the handles are also made of carbon steel you won’t want to be picking it up while it’s searing hot. The same advice applies as for the cast iron wok, buy a good wok spatula at the same time as buying the wok. You won’t want to be picking it up while cooking, use a spatula instead. ==>> Get a great price on the M.V.Trading Carbon Steel Wok. Click Here. The biggest advantage of carbon steel over cast iron is the weight. If you want a wok that is not as heavy as cast iron to lift up to your induction cooktop then the M.V Trading carbon steel wok is a good option. It will also heat up faster than a cast iron wok so, if time is important to you, opt for the carbon steel wok and you’ll be happy. The Le Creuset enameled cast iron wok is 14-1/4-inches in size and includes a glass lid. Le Creuset is renowned for their high quality cookware and adored by many but it is not for everyone. This wok is not inexpensive. It is an investment. You should only consider this wok if you can afford it. If you’ve owned a Le Creuset French oven or casserole dish before you’ll know they are heavy and high quality. This is a heavy wok and it holds heat very well. You only need to use medium heat rather than high heat and you’ll achieve great results. It does take time to heat up but once it has heated it holds heat really well. If you let the wok heat more slowly at first then you’ll get more heat up the sides rather than it being concentrated at the bottom of the wok. Because this wok is enameled it’s not as important that you season the cooking surface. Seasoning is still recommended but it can be used without. If someone accidentally washes this wok in soapy water it doesn’t matter. If you do that to a cast iron or carbon steel wok it will ruin the seasoning but an enameled wok is still usable. The Le Creuset wok is a statement piece for your kitchen. If you are the type of person who uses a wok all the time and you like to keep it out on your counter you’ll be proud to own this wok. It comes in a variety of colors and looks stunning in any kitchen. The added advantage of keeping it on your counter is that you don’t have to lift its heavy weight every time you want to use it. Will this wok damage my induction cooktop? Le Creuset is ideal for use on induction cooktops because of the cast iron content. Of course you need to be very careful when lifting a Le Creuset wok onto your induction cooktop that you don’t lower it too quickly and damage the top. Click image for the price on this wok spatula. Many cooks recommend using a silicone baking mat when using cast iron cookware on their induction cooktop. This saves the top surface from scratches. You’ll still need to be careful of the weight not coming down too quickly. If you are using in induction burner at the front of your cooktop it makes it easier to have more control over the wok when placing it on your cooktop. 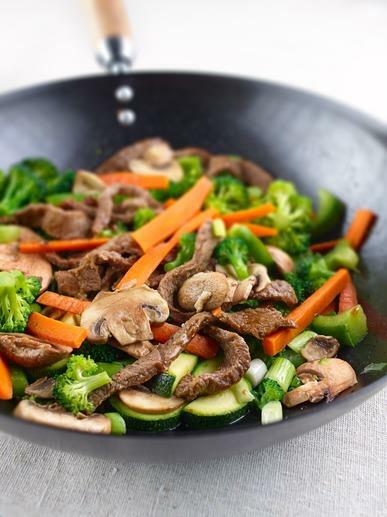 Because of its weight you’ll probably want to use a couple wok spatulas to stir your stir fries. Two spatulas can be used to toss the food without lifting the wok. If you want to cook multiple meals it is wise to purchase multiple double sets of wok spatulas to use without wasting time washing in between. The Le Creuset Wok is expensive. For the price, you get a high quality wok that looks stunning in your kitchen. The Le Creuset wok will hold good even heat. It won’t move around on your induction cooktop. It is a pleasure to look at and is a quality wok that will last a lifetime and beyond. If you can afford the investment, the Le Creuset wok should bring you enjoyment in your kitchen. Scanpan is a well-known Danish brand renowned for good quality cookware. 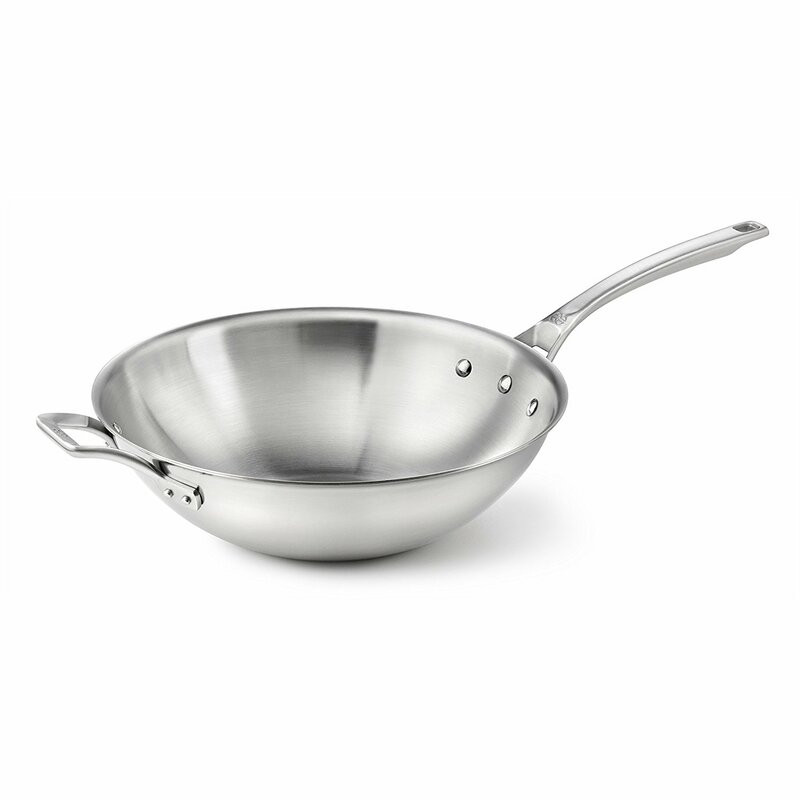 This 12-3/4-inch wok is coated with a PFOA-free non-stick surface. It is easy to use and is a much lighter weight for lifting onto your induction cooktop. It has a flat bottom. The non-stick surface is patented ceramic titanium and is tough enough to allow you to use metal utensils. The non-stick surface allows you to cook and sear at high temperatures. Most non-stick surfaces usually won’t let you do this. The pan is constructed in 5 layers from a stainless steel outer and an aluminium core with the special non-stick coating on the inner surface. This multilayer construction provides rapid and even heat distribution. The wok is oven safe and can even be used under a broiler. Does this wok need to be seasoned? Due to the materials used in this wok it does not require seasoning. This means you can wash it normally and it is also dishwasher safe. There is a lot of convenience on offer with this wok. Like other Scanpan products, it’s high quality and will last a lifetime. It is not recommended that you use a high heat setting with this wok. It is made in a way that you can generate high heat in the wok while using a medium heat setting. Often it is lower quality pans that need the heat turned up to high in order to get them to work properly. The Scanpan CTX 12-3/4-inch wok has a longer handle plus a smaller handle opposite the longer one. The longer handle in combination with the lighter weight is great if you want to toss the food. Tossing the food in a wok is a method which allows the food to be exposed to higher temperatures of heat for short bursts of time. It gives you some extra control over the amount of heat the food receives and allows you to prevent your meal becoming overcooked. If this is important for your style of cooking then the Scanpan CTX Wok may be exactly what you’re looking for. This wok offers a lot of advantages over traditional woks. It is lighter in weight. It can be washed or placed in the dishwasher. You can toss the food while cooking. There is no need to season the wok and it is a high quality product that will last a lifetime. The Calphalon AccuCore wok is a stainless steel wok. It is constructed from 5 metal layers. The core is copper which provides controlled even heat. The inner layer contains aluminum for heat conductivity and the outer surface is stainless steel for durability. It has a flat botton and is suitable for induction cooktops. Stainless steel does not need to be seasoned like cast iron or carbon steel. This wok is dishwasher proof. It is also much lighter than a cast iron wok. If you’re looking for a cheaper option, this Calphalon flat-bottomed wok is also induction compatible and good quality. The stainless steel construction means you can place it in an oven or use it with a broiler. However, the sides are quite tall so you probably wouldn’t have any reason to use it under a broiler. Still, it is good to know you have lots of cooking options available on this quality piece of cookware. This induction wok has a long handle with a smaller handle on the other side for easy lifting. Being a lighter weight, this wok can be used to toss food in the air while cooking. The longer handle means it stays relatively cooler than short handles. Why shouldn’t I turn the heat up high straight away? This wok achieves high heat but it is not recommended that you crank up the heat setting to high the first time you use it. Like any new stainless steel pan you need to start slowly and get a feel for how it reacts to being heated. If you go straight to a high setting you may risk burning your new wok. Being a high quality piece of cookware you only need a medium setting to achieve high temperature results. While this wok is lighter than cast iron, it holds a large capacity and once you have lots of food in it you may find the weight too heavy to lift easily. 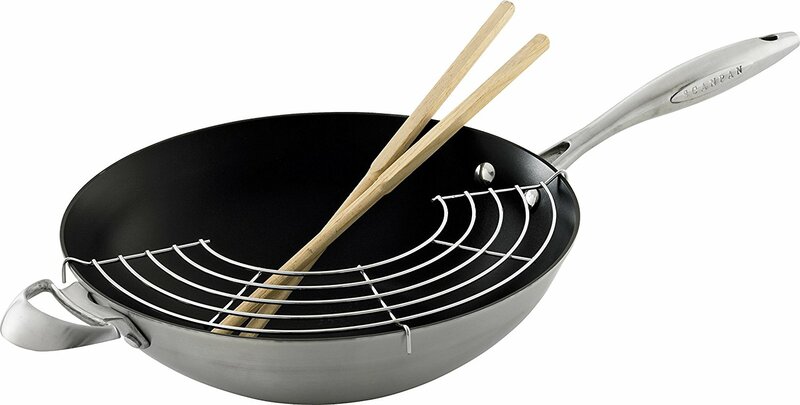 Like the heavier woks, be sure to purchase two wok spatulas to move you food around and lift the food out for serving. What are the advantages of stainless steel? One of the biggest advantages of a stainless steel wok is the variety of food you can cook in it. In a traditional wok that requires seasoning you can’t use acidic foods like lemon juice, tomatoes or pineapple. If you like to cook dishes with lemon juice you’re going to destroy the seasoning on a cast iron or carbon steel wok. If you like the taste of throwing some pineapple into your stir fries then a stainless steel wok is ideal. It will not react with acidic foods and will retain its durable silver finish. The Calphalon AccuCore stainless steel wok has high sides and a large capacity so you can cook a lot of food. The heat distribution is extremely good and the stainless steel surface is high quality. With the convenience of being able to put this wok in the dishwasher it will appeal to many home cooks. In particular, you’ll appreciate being able to use acidic foods in your stir fries and other meals. There are no limitations on this high quality induction wok. ⇒ Looking for the Best Induction Cookware? Click Here for the Ultimate Guide to the Best Induction Cookware Sets. ⇒ Do you need a portable induction burner for your RV, boat or holiday house? ⇒ Have you tried home made ice cream? Read more here. This entry was posted in Induction Cooking on March 17, 2017 by Edwina. 6 Easy Steps for Choosing the Best Beverage Cooler – Your Perfect Soda or Beer Fridge Awaits! This function has been disabled for The Equipped Cook.